I don’t know about you, but the past couple of months have been a little rough mood-wise for me. I tend to suffer each winter from SAD (seasonal affective disorder), and my body has been feeling sluggish, unmotivated, and low. I’ve been negative and giving myself guilt over not being “productive enough”. When I give myself permission to be mopey, especially in these darker winter months, my compassion for myself grows and it’s much better. It’s so easy to forget that our lives are cyclical and constantly transitioning from spring, summer, autumn, winter. The tides ebb and flow, and so must we. Life is about change & adaptation – remaining compassionate with ourselves in our “low” times is essential to maintaining fullness & well-being. There were a few beautiful, sunny, warm days last week here in Asheville, NC. I took full advantage of the brighter days, and went for a walk at one of my favorite spots – Biltmore Estate. My legs & hips were being a little funky – my walk wasn’t as smooth as I wanted. I felt some older shin-splint injuries acting up. So I switched it up and started to walk backwards. I ended up walking about 1/3 of the hour walk completely backwards. How liberating!! It was refreshing & rejuvenating not only from a muscular standpoint – it gave some muscles a rest, and worked new ones – but also somatically, all-over it offered a new perspective. I was looking backwards, but blindly moving toward an unknown. I was looking at the places I’d been, without a visual of where I was going. I thought about the past year and how cathartic reflecting on the past can be when we start something new. When I did turn around, I was slightly dizzy for a few steps, which offered it’s own perspective of adapting to moving forward again. So often we move forward, anticipating our next steps, possibly getting anxious or contracted about what’s to come, we forget sometimes if we looked behind us, we’ve already come so far. Halloween is right around the corner, which means that we are officially on a log flume ride to more holidays and (potentially) BUSY, full days. It’s hard to slow down these days to take those pauses. I found myself saying the other day “It’s hard for me to stop what I’m doing long enough to figure out something better!” The “to-do” list seems never ending, and for me, can keep me up at night ruminating. I know it sounds counter-intuitive – but, if we take the time to pause and slow down, we actually HAVE MORE TIME to do all the things on our list. As much as I KNOW this to be true, even I am challenged with this, and have a hard time carving out the time. I have set random reminders on my phone to **trill** a “take a breath, feel your body” periodically throughout the day. It’s helpful to have that outside Pavlovian bell to help me remember that immensely helpful pause. Each little minute – second even – are cumulative in helping your brain respond to stress more easily. I use a Mind Jogger app to help with reminders. The one I use is 99 cents, but there are free ones available too. Celebrate your curvy spine and change your relationship with your body! This highly transformative workshop is coming to Asheville for the first time, and who knows when it’ll be back. Explore the natural ability of the brain and nervous system to change itself – towards more mobility, improving posture, sensation, control, and less pain. All participants will go home with an illustrated manual, and videos to support your learning process. I’m proud to be hosting and assisting Laura Gates for this weekend workshop. In addition to the 2-day workshop at Violet Owl Wellness, Laura will be available for private sessions at my office at 25 Reed St. Contact Laura through her website for more information and registration. This has been going really well! I’m excited to be offering these each week. These are basic, gentle half-hour somatic movement explorations – for anyone who has been curious about a somatic movement practice, and for those who want a check-in for their own self-practice. I’m also happy that I can offer the recordings for a week via a private link if you are not able to make it to the live class. Register here for either a one-time tryout, or a 4-week bundle. In this 90 minute workshop, we will explore the habits that may be causing pain or restriction in our day-to-day movement. Chronic pain in our shoulders, neck, hips caused by our modern lifestyles can be distracting from living life to the fullest. Somatic movement explorations slow down these painful patterns in order to regain healthier control. By using our natural reflex of pandiculation (a “yawn-like stretch”), we can actually reset the length of our muscles and regain control for greater freedom of movement. You will leave with a set of movements that serve as an overall “reboot” to your muscular system. This is a very gentle class, appropriate for anyone at all levels of fitness. Come learn to pandiculate! Pre-registration for this workshop is required, both to get a head count and to make sure there’s enough space for everyone. Please let me know at your earliest convenience if you want to reserve a spot. Anyone is welcome, first come first served, so if you want to bring your partner, friend, family member or a stranger, just let me know. ~ If you can sense it and feel it, you can change it. Next month, on November 3-4, my amazingly talented colleague Laura Gates will be teaching her specialized workshop right here in Asheville at Violet Owl Wellness – Somatic Solutions for Scoliosis and Uneven Posture. In addition to the weekend workshop, there will be opportunities for health professionals to learn skills to help their own clients, private sessions available with Laura to help with individual issues, and a manual to continue self-care at home. Celebrate the curves of your body and learn ways to increase joy with movement, freedom from pain, and empowerment for your life! For more information, and registration (early bird rate is available until mid-October! ), visit Laura’s website here. As long as you’re safe, that is… And wearing a seat belt – I failed to put mine on for this demonstration, which can affect your sensitivity to arching and releasing. It can be challenging to fit in a proper, lie-down-on-the-floor practice everyday – so fit it in where you can! It’s also highly beneficial to fit in somatics practices throughout your day, in day-to-day life, so that it becomes a habit when you need it most and not actually thinking about things. Ooooh, what a bittersweet time of year – as we wrap up summer and the chillier nights arrive to welcome fall. For me, this particular fall is a BIG ONE. I send my daughter off to kindergarten, which means big transitions and changes for our family. I am having so many feelings going through me all at once. Excitement, grief, happiness, dread – I go from being a full-time mommy to having a lot more time to devote to my own practice and self-care. Transitions can be hard, but I am so thankful for my own mindful-movement practice – I don’t know what I would do without it. It’s a lifeline when new challenges come up. It offers me the opportunity to notice and pause so that I can respond rather than react. Sometimes I would make the same choice as the initial reaction, but it feels better to me to have that choice. I’m also noticing a LOT of tension that just doesn’t want to release in my neck and shoulders specifically. I’m getting these little *twitches* when I realize I’ve been focusing or thinking about something too long. I had the pleasure of having a private session with a somatics colleague last week, and was reminded of the importance of getting an outside perspective to improve a self-care practice. A regular personal movement practice is essential, but returning to get help from others and making connections is essential as well. It was a huge reminder for me that growth never stops, and asking for help is well, super helpful. I will have expanded office hours for private clients, and time to teach out in the world and virtually. I look forward to seeing you soon online and in-person – there’s a lot going on! $60 for the series, must pre-register through Violet Owl. Mysterious muscle pain can be distracting, and a Somatic Movement Practice can help to not only relieve that pain, but help you learn to release and even improve day-to-day movement. This series directly addresses patterns in the body that have nothing to do with aging, and all to do with the habits we develop over time – habits that can be reversed. Each class will focus on a particular muscular pattern that we all experience in day-to-day living, and offer gentle movement explorations to specifically move freely in and out of that pattern. You will leave with a movement routine that you can use to continue to free and improve your balance, flexibility, and everyday movement. Taught by Laura Gates, this workshop addresses uneven posture, scoliosis and offers effective, non-invasive techniques for changing, improving, and preventing it. We will celebrate our curves, improve our relationship to our bodies, and explore the natural ability of the brain and nervous system to change itself, towards more mobility, improving posture, sensation, control, and less pain. All participants will go home with an illustrated manual, and videos to support your learning process. I am now offering audio recordings of past online series as class series. You may purchase these through my website, and I will send you a link to download them within 24 hours via WeTransfer. These are specialized classes that explore not only the bigger patterns through Hanna Somatic movement, but the smaller, subtle movements that can really help bring awareness to the entire body as a functional system. Click here for more information on each class series. If you are experiencing mysterious muscle pain and can’t seem to figure it out to move freely, come in for private sessions to learn how patterns that have been with you a long time may no longer serve you, and learn how you can finally release them for better habits of movement. Because of my own journey, I enjoy helping people overcome neck and shoulder pain, but a Somatics practice serves the entire body. Private sessions are gentle, hands-on guided movement to directly address those patterns. Contact me for private sessions at my office at 25 Reed St in Biltmore Village. Get out of pain, and feel increased freedom of movement in all the activities you love to do. 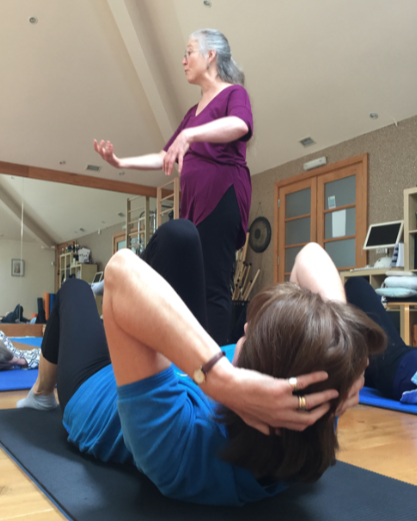 We’re trying a new thing – online Morning Somatics classes! We’ll start these July 17, and see how they go. If we’re all enjoying them, I’ll continue them indefinitely, and maybe even add another one during the week. These will be basic and gentle explorations – suitable for anyone who is curious about somatic movement practices, and also offer those more experienced students who would like some variety. Click here for more information and registration for online classes. Can you believe summer is coming to end already? I can’t. As beautiful a season fall is, I am always sad to see summer go. I love the heat, and for some reason I am a bit immune to humidity in the air. So the south really is a perfect place for me to live! What are your patterns? In movement and emotionally? They tend to be similar if you look at them. So many of my students try to “help” gravity, by holding themselves up off the floor when they could surrender to notice what patterns are really being held. Sometimes we “help” when we aren’t needed, but we hold that extra little tension just in case we’re called to action. It’s that little bit of “I’m ready” tension that actually creates the patterns that keep us restricted in movement. We lose the ability to use the part of our muscles that lie beyond that tension. When we give over to the concept of “allow” and “surrender”, we offer ourselves the opportunity to see what is truly there – the length, the availability, the possibility. Can you recognize when you are holding a little extra tension in your body? In your feelings? In your relationships? Can you give that part of you a different task, something else to think about and do? If part of you wants to always “help out”, what possibilities lie in letting that go? In these 6 weeks, we will be learning Tom Hanna’s “cat stretch” explorations, found in Somatics: Reawakening the Mind’s Control of Movement, Flexibility, and Health. These movements are a basic tonic to address the main movement patterns that can lead to restricted movement due to pain or inflexibility. We have many patterns that help us with all our day-to-day activities, but sometimes if we repeat the same movements over and over, it can lead to overly contracted muscles, restricting full freedom of movement. Hanna’s series helps to “re-train” the brain’s control over these patterns for greater flexibility and muscle balance. This is a very gentle class that offers you simple, straightforward movement explorations that you can do at home for continued self-care. All are welcome for this wonderfully guided self-exploration series! See Violet Owl’s website for more information. Walking is one of the most basic human movements. We teach ourselves how to walk when we are babies, yet sometimes life brings aches and pains that cause our gait to get a little “off”. Free and easy walking depends on freedom of movement in the center of the body. In this two hour workshop, we will break down the mechanics of walking using gentle and easy explorations enabling your hips and shoulders to work together freely and easily. Join us in learning how utilizing the central nervous system with slow, gentle movement can re-pattern muscle habits, leading to fuller function. This will be a fun class offering a new perspective on how your whole body can move with ease. All levels welcome. Movement, yoga, & fitness practitioners encouraged. These small classes are limited to 5 people. We will be going over basic Somatic movements to address muscular habits that are holding you back due to pain, imbalance, or just the feeling that you can move better. With such a small class, we have the opportunity to have more individual attention to your particular patterns. Please email me in advance to reserve a space. This series is for somatics practitioners from all fields and anyone else wanting to gain a little more information about the ‘hows’ and the ‘whys’ of somatic movement. Somatic Movement practices differ from a more conventional approach in that we work “with” clients rather than trying to fix someone from the outside. We use Hanna Somatic Education as a base for discussions in neurophysiology and philosophy, have a short, guided movement exploration, and end with a few minutes of reflection and sharing. This is a conference style “virtual” classroom, where we can see each other, but for most of the class everyone (except me) has their eyes closed. Make sure you have enough room on the floor to move freely, and a camera so that I can see you. If you like, you can still participate without being seen, and still hear and see me. Purchase the series here for $100. Audio downloads will be made available for purchase within a week of the actual class. If you are in the Asheville area, contact me for private sessions at my office at 25 Reed St in Biltmore Village. Private sessions are a great way to identify specific habituated muscle patterns that may be holding you back from living the life you want to live. I recommend starting with 3-5 sessions to establish a foundation and to incorporate somatic movement into your daily practice. Then, attending regular classes will maintain and enhance your daily practice on your own. You are receiving this email because you have expressed interest in Hanna Somatics or have been a student. I promise not to bombard you with emails, but if you no longer wish to receive these emails, please let me know.